The foolish leaders of America and Iran would be wise to simmer down tensions in the region, draw away from accusatory stances, and behave like responsible states for once in their history. If not, both the bankrupt U.S. empire and the bankrupt Islamic Republic will be destroyed in any coming war along with their pet obsession Israel. President Obama on Friday criticized Iranian leaders for undermining the “spirit” of last year’s historic nuclear agreement, even as they stick to the “letter” of the pact. In comments following the Nuclear Security Summit in Washington, Obama denied speculation that the United States would ease rules preventing dollars from being used in financial transactions with Iran, in order to boost the country’s engagement with the rest of the world. 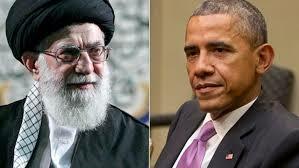 Instead, Obama claimed, that Iran’s troubles even after the lifting of sanctions under the nuclear deal were due to its continued support of Hezbollah, ballistic missile tests and other aggressive behavior. Nearly six months after the Joint Comprehensive Plan of Action (JCPOA) between Iran and the P5+1 was agreed, seven out of ten Iranians approve of the deal, but only 34% believe the U.S. will comply with its terms, according to a new poll released here Wednesday by the University of Maryland’s Center for International & Security Studies (CISSM). Conducted on the eve of the JCPOA’s “Implementation Day” last month and roughly eight weeks before critical parliamentary elections in Iran, the survey found that President Hassan Rouhani and Foreign Minister Javad Zarif enjoy remarkably high approval ratings among the public – 82% and 78%, respectively – although those results were down slightly from a similar poll taken in August, just after the JCPOA was concluded. Diminishing optimism about the economy – including the speed with which the JCPOA will pay off in providing new investment and employment – and some disappointment with the deal itself ma account for some of that decline, according to Ebrahim Mohseni, the survey’s director.